St. Louis Public Library will partner with the International Institute of St. Louis for this one-time workshop on becoming a U.S. citizen. Learn the steps of the citizenship process, the resources available to new residents in St. Louis, and some tips and tricks for making the experience easier. Current U.S. citizens who would like to learn about the process and discover ways to help their international neighbors are encouraged to attend as well. U.S. 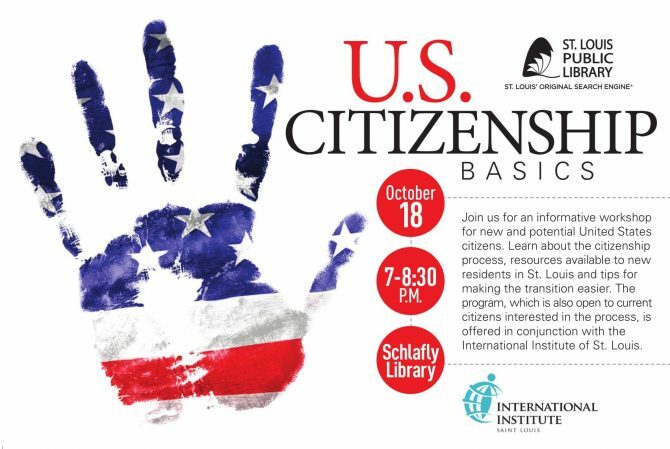 Citizenship Basics will be held at the Schlafly Branch Library (225 N. Euclid) on October 18 at 7 PM.